It's spring time and that means it's time to gear up for camping season and dutch oven cooking. I've always enjoyed using my dutch oven to cook over the coals while camping but I've never used cast iron for much of anything else until a year or so ago. I picked up some enameled cast iron pots and have really enjoyed cooking with them for everyday meals. I'm sure many of you are familiar with and extensively use cast iron skillets as well but I still haven't really branched out in that direction yet. I recently received the new Lodge Cast Iron Cookbook and I think it's going to be a lot of fun exploring some fun new ways to cook with Cast Iron. Once again, the Virtual Potluck team has come up with an assortment of great dishes for you to try from the new cookbook. Check out the roundup page here! I went with a classic comfort dish from the cookbook but it had a fun twist that I think made it something that I'll enjoy many more times. It was a traditional Shepherd's Pie but instead of using ground beef it used chuck roast which made it so much better. 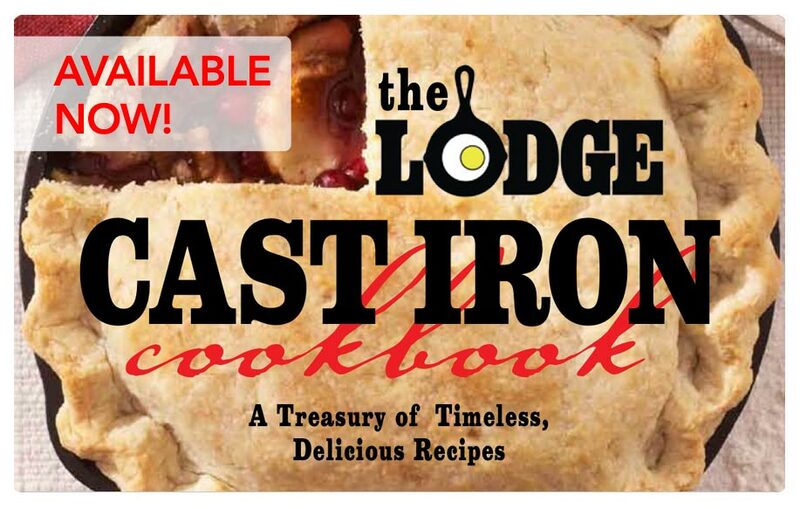 If you'd like a chance to win a copy of the new Lodge Cookbook, leave a comment below before April 8th and I'll choose a lucky winner! 1. Make the filling: Preheat the oven to 325 degrees. Heat 2 tablespoons oil in a 5-quart cast iron Dutch oven over medium-high heat. Add the beef, half the onion, half the garlic, the salt, black pepper and red pepper to the pan and cook until the beef is browned on all sides, about 5 minutes. Add the broth, oregano, thyme and parsley. Cover the pan and transfer to the oven; bake until the meat is fork-tender, about 2 hours. 2. Remove the meat and broth and wipe the pan clean. Place the remaining 2 tablespoons oil in the pan and heat over medium-high heat. Add the remaining onion and garlic and cook, stirring often, 2 minutes. Add the carrots, peas, and celery and cook, stirring often, 2 minutes. 3. Return the meat to the pan, stir, and add enough of the broth to cover. Season with salt to taste. Cook over medium heat, stirring frequently, 5 minutes. 4. Place the flour in a cup and slowly add the water, whisking until smooth; if any lumps form, strain the flour mixture through a sieve. Add the flour mixture to the pan and stir well to blend. 5. Increase the oven temperature to 350 degrees. 6. Make the mashed potato crust: Place the potatoes in a stockpot; add the water and salt and bring to a boil. Cook until potatoes are tender, about 10 minutes. Drain thoroughly. While the potatoes are still hot, stir in the butter until it melts. Add the milk, half-and-half, and pepper; mash until smooth. 7. Spoon the mashed potatoes over the filling in the dutch oven. Bake on the center rack, uncovered, 30 minutes. 8. Turn on the broiler and broil until the potatoes are browned, about 5 minutes. Check often to prevent burning. My gosh, that looks tasty! I love Shepherd's Pie, but I've never made it. This looks so yummy. I also love Lodge cast iron...it is the best. That is the best looking shepherd's pie that I've ever seen! Gorgeous photos too! I love shepherd's pie. Great photos as always--love the steam! I've never made shepherd's pie but have enjoyed it at the house of English friends; I'll have to try it! Husband loves Shepherd Pie, so I would be making this if I was the lucky winner! I absolutely love Shepherd's Pie and yours looks so good. Comfort food. Matt, can I seriously just come and have dinner at your house every night! Everything you post about sounds so incredibly delicious.... I am jealous. Your wife, friends, family and coworkers are truly blessed. And where was all this delicious cooking when we were in high school?? Liz, you are welcome here anytime! Trust me though it's not every night... We have our share of hot dogs with mac and cheese too. I love this giveaway. Your blog/food looks delish and so all the new food blogs I have been introduced to tonight with this giveaway. I am a foodie, love to cook/bake/garden and anything outdoors is for me. Thanks to you and everyone and the Lodge too. Looks amazing! The steam is awesome! Know you are loving that new lens! Woah, that looks really good! Such great comfort food! Yum! A great take on one of my favorite comfort foods. I don't eat much meat but your dish looks great (minus the peas, never liked them and never will!). This would be a wonderful lunch to have after playing outside in the snow with the kids, a nice hearty meal. Great job. at what stage in the process do you cut up the meat? or does it just fall apart in the oven? Typically when you buy chuck roast or stew meat, it will come in large chunks. You can cook it as is, or chop it up into smaller bits before browning it. Looking forward to trying this, one of the best comfort foods ever invented. My grandmother that lived next door to me growing up used to make a great Shepherd's Pie. It's too bad I can't get my kids to eat it otherwise I would make it more often. Great looking meal! That looks so amazing! I can't wait to try it! Mmmmm... I could use a bowl of this right now! I love Shepherds pie! I think i will have to buy a cast iron pot so I can try this recipe. yum!